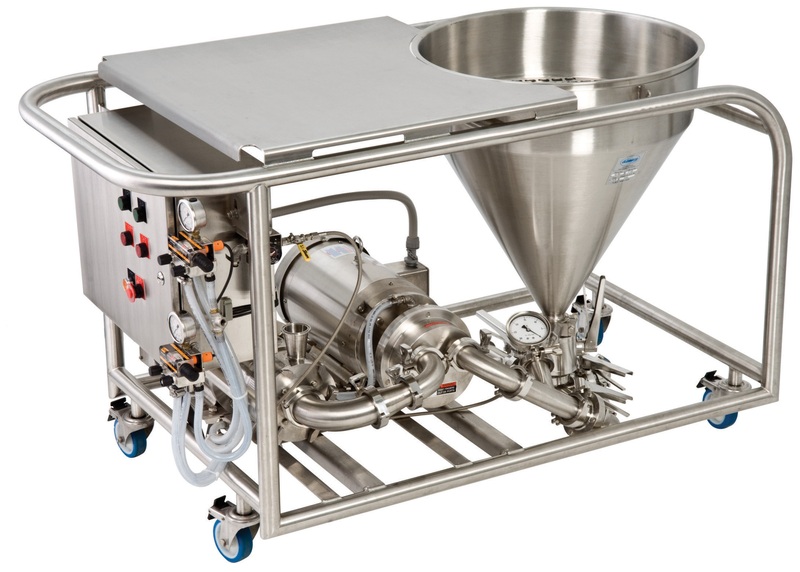 High Shear Emulsifying Mixer – Admix, Inc. In industrial and commercial settings, bulk materials have to be mixed all of the time to blend ingredients for a final product or add important preservatives. Bulk material mixing equipment is used in agriculture, food processing, mining, pharmaceuticals, and more. If the right equipment is not used to create the desired consistency, then the final product will not be up to industry standards. 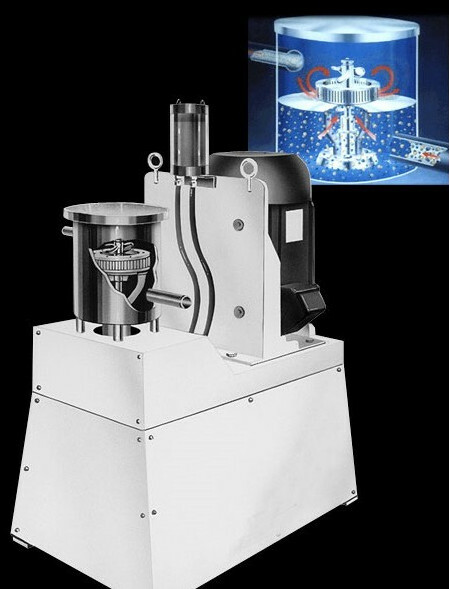 The proper consistency depends on the precision of machine’s speed, the radial reach of the mix components, and the temperature within the mixing chamber. If these variables cannot be controlled, it is impossible to control the quality of the bulk material. Any mistakes in the mixing process could lead to costly errors that result in a ruined batch or wasted production time. For some products, the mixing stage is when wet matter is introduced into the dry material. Other materials remain dry during the entire process. Typically, wet materials result in a heavier substance, so wet bulk material mixers require more power. They still need to be able to mix the material at a very high speed because often it is best when air molecules are present between solid particles. Mixing components can be removed from a mixer for cleaning, and different attachments can be temporarily installed for use with one-off or unique material batches. After mixing, substances can be manually discharged from a mixing tank, or they can be removed pneumatically using a tube that attaches to the tank. Some high capacity mixers have an integrated bulk bag filler for use after the material has been mixed. Mixers are used to blend pet food, fertilizer compounds, baking ingredients, cosmetic products, and more. The nature of the material being mixed plays a huge role in choosing the optimal piece of equipment. It is also very important that the mixer has a seal that prevents dust and particles from being spread throughout the facility. Loose particles and dust can be harmful to workers in the facility and can gradually cause damage to other equipment. 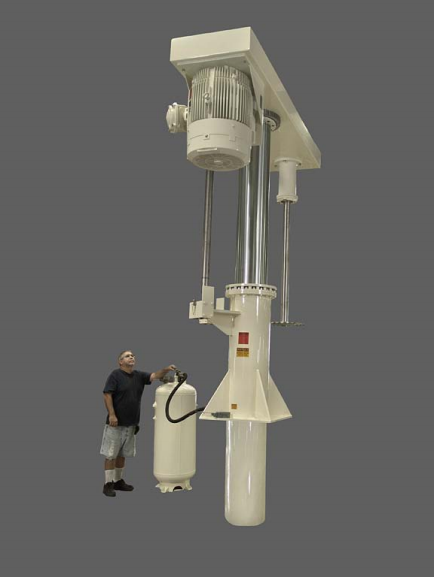 Double Helixx Laboratory Mixer – Arde Barinco, Inc.
One of the most common types of mixers in a bulk material handling system is an auger mixer. An auger mixer is a powerful piece of equipment that has the capacity to quickly mix and blend bulk materials into a smooth consistency. 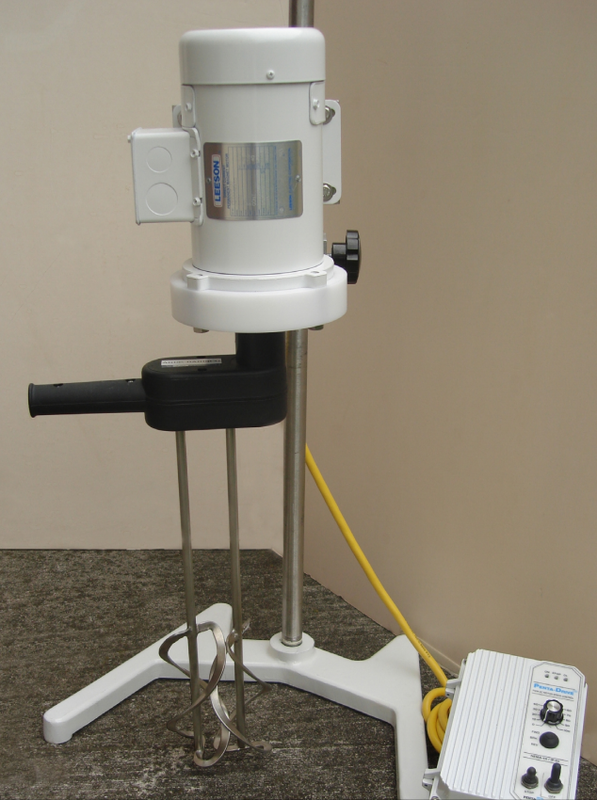 Most auger mixers stand vertically in a facility on a sturdy metal frame. The auger is powered by an external electric motor that turns the auger rapidly through the bulk material. Depending on the desired consistency, the auger attachment may be changed. A long auger will create a more even blend throughout the tank, while a short one will produce more fine contents on the bottom. Some auger attachments are built with a diameter that is almost as wide as the diameter of the inside of the tank. Materials are loaded through an opening in the top and then extracted after mixing via a pneumatic conveyor or a discharge door in the bottom of the mixing tank. 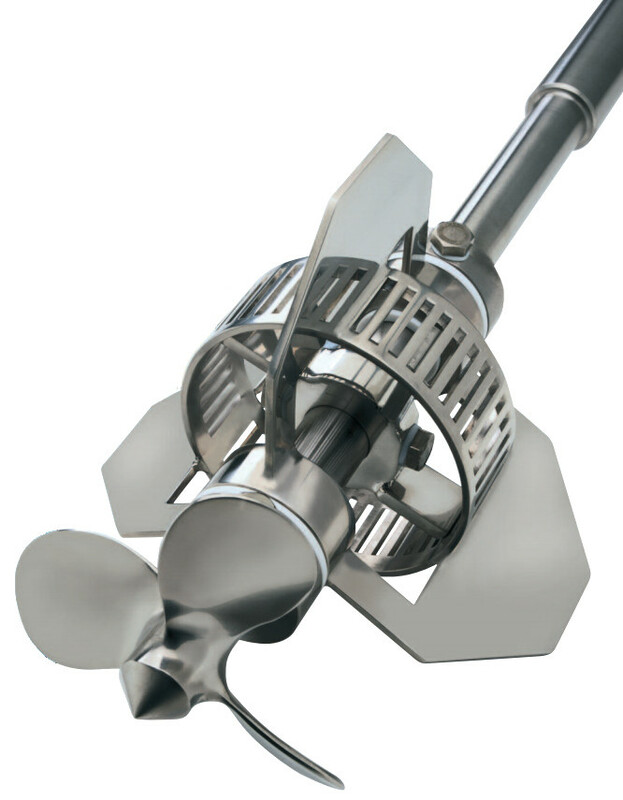 Most auger mixers are constructed using stainless steel so that they can be thoroughly cleaned between uses. This prevents cross-contamination and material buildup that could be harmful to the equipment or the mixture itself. The head of the auger can be removed for cleaning outside of the tank or to add a different attachment. Powder Feed and Dispersion System – Admix, Inc. 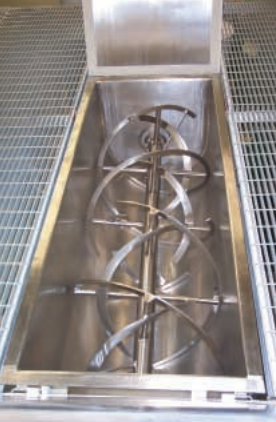 The shape of the auger’s sharp blades move material on either side of it up the center and then down the walls of the tank. This continual cycling motion is what makes the auger mixer so effective. Some smaller auger mixers actually run horizontally. An access door allows the operator to open the top of the mixer and dump bulk materials in, and then the machine can be turned on to mix materials once the door has been closed. Doors on a horizontal auger mixer are usually made of transparent fiberglass so that the person operating the machine can monitor the change in the material’s consistency. Large bulk material handling systems are built to handle high volumes of bulk material on a daily basis, and these systems need mixers that have a capacity to match their batch sizes. Large bulk handling systems are very costly, so they are most efficient when they can frequently process high volumes around the clock. To mix these batches, industrial facilities use one or several high capacity mixers. A high capacity mixer is usually built with a large central auger that churns material, much like a regular auger mixer. However, the difference is that the power put out by the auger and the sheer size of the mixing tank itself is much greater. A high capacity mixer looks more like a storage silo, with a hatch at the top to add materials to the tank. After mixing, materials can then be discharged into bulk bags or bins using the door at the bottom of the tank. A pneumatic conveying system can also be fitted to the top or side of the mixer to pull materials out once the batch is mixed. A high capacity mixer for industrial use can be built with well over 1000 cubic feet of capacity. A quality high capacity mixer can process large volumes of material without compromising the consistency and precision of the mixture. Powerful variable speed motors turn the mixing mechanism and push through heavy materials to evenly blend them. A high degree of control over the exact speed of the mixer enables workers to mix batches with the exact same texture every time. Sensors and instruments attached to the mixer input information to the control unit and display important stats to operators in the facility. This information is used to optimize efficiency and maximize batch output. Performance issues can also quickly be identified and addressed with this information. High capacity mixers are used in industries and applications where high volume production is very important. This includes cosmetics, food processing, pharmaceuticals, and more. If you are handling bulk materials for use in a cosmetic product, for example, you need a large batch all at once otherwise, the cost of the product will be greater than the revenue from the final product. A ribbon blender is a high-speed mixing unit for bulk material handling facilities. It is similar to an auger mixer, except the unit is usually built with smaller dimensions. The ribbon or auger in the machine is designed in a helical pattern that enables that machine to mix materials homogeneously and completely discharge a batch when the process is complete. Ribbon blenders come in vertical and horizontal mounting options, and the type and size of the machine is chosen based on the materials being processed and the space limitations of the bulk handling facility. The ribbon in the blender is set in a U-shaped trough. The screwing motion caused by the ribbon pulls material through this trough and then lifts it up, slowly forming a pile. After they have been picked up, materials blend by falling together into this pile. Once the blending process is finished, materials can be discharged from the ribbon blender by opening the door on the bottom of the tank. This door is opened using a lever or automated controls. The blender remains on as the door is opened, and materials fall through to a bin below as they are pushed by the ribbon to the center of the tank where the opening is. After the machine has been turned off, the access door can be opened and all of the parts can be cleaned. Like most bulk material handling equipment, ribbon blenders are often constructed using stainless steel. Not only is this material strong and highly resistant to corrosion, but it is also very easy to clean. In some facilities, cross-contamination of ingredients is a major concern, so machines are all cleaned between batches. Ribbon blenders are used in many industries; from food to pharmaceuticals to cosmetics. Because of their balanced blending abilities and consistent mixing quality, ribbon blenders are an excellent choice for many bulk material handling facilities. The range of sizes created by blender manufacturers makes it possible for both small and large plants to utilize the efficiency of a ribbon blender in whatever space they have available. Mixers & Blenders In industrial and commercial settings, bulk materials have to be mixed all of the time to blend ingredients for a final product or add important preservatives. Bulk material mixing equipment is used in agriculture, food processing, mining, pharmaceuticals, and more.